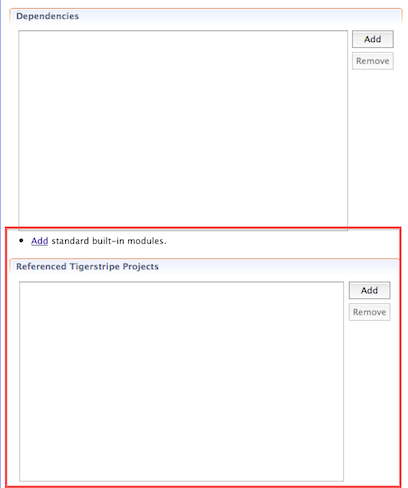 In the past, the dependency page of a Tigerstripe descriptor editor contained two lists: 'Referenced Tigerstripe Projects' and 'Dependencies'. There was also a link to 'Add standard built-in modules'. This was simplified by providing a single list where all model dependencies can be specified. 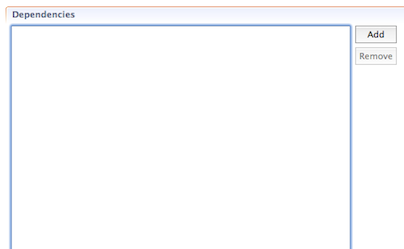 The different type of dependencies are distinguished by different icons. The link was also removed as it's no longer needed. Extra column in Attribute/Constant/Method list of editors has been removed. 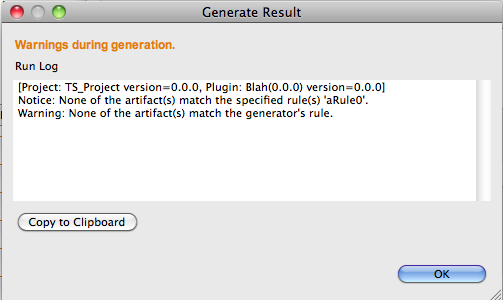 The following warning message is generated when none of the generator rules match the model artifacts. This defect prevented users from clearing extensions of Association Classes. It has now been resolved. In the past when diagrams were moved from one package to another, the associated package name was not updated properly. As a result, this would lead to an auditing error. Issue has now been resolved. Deleting packages would also remove the hidden .package file, which would result in the incorrect presentation layout. It would also lead to some files being automatically removed in sub-packages. Annotation View used to throw an NPE in certain cases. This issue has now been resolved. Project import in headless mode is now working. Please click here for more details on headless model generation with Tigerstripe. Please note that you have to specify an absolute path for PROJECT_IMPORT argument. There was an intermittent issue with the generator form editor where the artifact type of a rule was ot getting persisted properly. 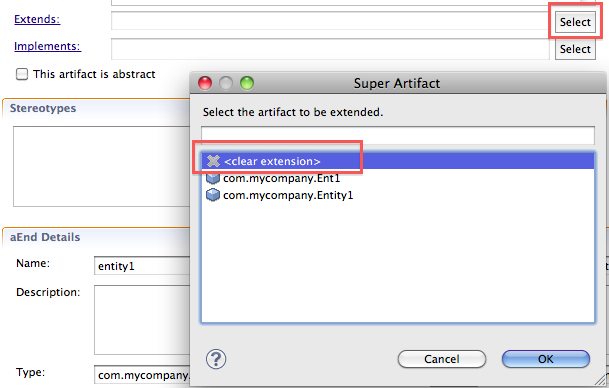 For example, selecting 'Entity' as an artifact type would persist it as 'Enumeration'! This issue was identified and resolved. NPE would be thrown every time TS descriptor file was modified and saved. This regression was quickly identified and resolved. Fixed an issue where diagram files would get marked as SCM dirty when opened for first time. Fixed an issue where instance diagram files would not be displayed in source folder of TS Explorer. Fixed an issue where opening package of a model would throw an exception. There were issues with reverting files in TS Explorer that are now resolved. This deadlock presented itself in certain dependency structures. 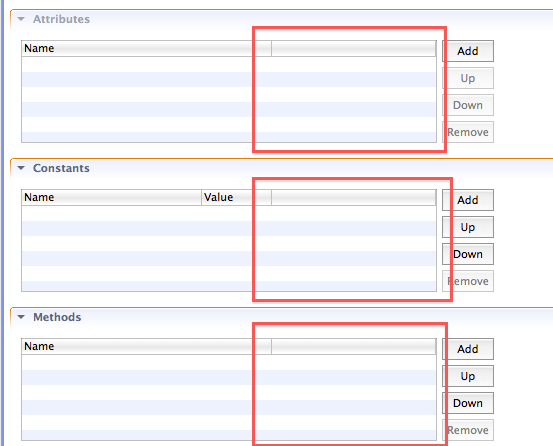 Modelers now have the option of annotating method arguments. 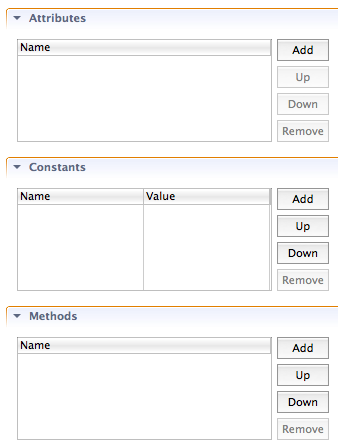 Support the method argument in form editor and modify annotations via Annotations View. Resolved an issue where an error occurred when logging was enabled in generator. Bugzilla 320730 - Should new package wizard request for an Artifact package? Bugzilla 251717 - Need to document the use of Tigerstripe's Buckminster integration. Bugzilla 291048 - Add support for buckmister headless commands. This page was last modified 16:57, 22 December 2010 by Navid Mehregani.